Fact: Sixty percent of new cancer patients are over age 65. Fact: The median age at the time of a cancer diagnosis is 68. Fact: The risk of developing cancer increases with age. One patient is age 47, employed full-time, married with teenage children living at home, and with no other notable health conditions. Her course of treatment is fairly straightforward, given her relatively young age, overall good health, and family support. The second patient is a 72-year-old retired widow who lives alone. She has a history of heart problems and diabetes and sometimes has difficulty completing everyday chores due to osteoarthritis in her hips and knees. These complexities may play a role in her course of treatment – if, in fact, chemotherapy or other treatments are really the best options, or if she wishes to undergo treatment at all. Even though these two patients’ diagnoses of breast cancer may initially seem similar, there are some obvious differences. These include not only the patients’ ages, but also their individual lifestyles, overall health, and support networks. These factors, plus several others, can play a large role in how physicians recommend treating their cancer. What makes caring for older adults unique? 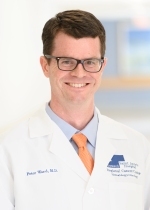 Peter Ward, MD, brings unique credentials to his leadership of Saint Anne's Hospital Regional Cancer Center's recently launched Senior Adult Oncology Program. Dr. Ward attended the Chicago Medical School, completed a residency at the University of Vermont Medical School, and completed a combined fellowship in oncology and geriatric medicine at the David Geffen School of Medicine at UCLA. He explains that, in addition to evaluating a patient’s cancer diagnosis and other health conditions, functional age plays a large part in determining a course of treatment for an older adult. “Rather than chronologic age, which measures only a person’s years, functional age reflects an individual’s physical abilities, their ability to perform activities of daily living, and other health conditions related to aging that may affect a plan of care,” explains Dr. Ward. “For example,” he asks, “is the patient relatively fit, or frail? Does the patient have problems with balance or difficulty walking? Is Dad able to complete his daily work or chores independently most of the time, or does he require assistance getting things done? Is Mom in otherwise generally good health, or does she also have other conditions, such as heart disease, diabetes, memory problems, or poor nutrition, that would pose a risk during cancer treatment? “These are the kinds of things we evaluate and take into consideration when planning an older person’s course of care,” explains Dr. Ward. What does Saint Anne’s Senior Adult Oncology program include? In addition to medical evaluation by Dr. Ward, a typical Senior Adult Oncology Program consultation includes several assessments. These include visits with a specially trained registered nurse and social worker who assess their physical functioning and ability to carry out activities of daily living. Participants also undergo a “Get Up and Go” test, which checks the patient’s risk of falling based on a simple mobility test. They also may undergo depression screening, nutritional assessment, brief cognitive assessment, and a review of medications. These combined screenings and assessments are used to estimate the patient’s prognosis and risk of complications and side effects during treatment. Why is there a cancer program just for seniors? “The Senior Adult Oncology Program helps to ensure that older patients receive the best treatment plan not only to treat their cancer, but also to minimize side effects and potential complications that can occur more frequently in older adults with cancer,” Dr. Ward says. He notes that discussion of a patient’s personal preferences is an important part of this evaluation, too. Saint Anne’s Senior Adult Oncology Program brings together the expertise of clinicians specially trained in caring for older patients with a cancer diagnosis. In addition to Dr. Ward, oncology-certified registered nurses with special training in geriatrics, and social workers, the team includes a nurse navigator who assists in a patient’s referral to the program, plus a pharmacist, registered dietitian, and outreach program coordinator who is certified as a senior fitness specialist. Each plays a vital role in caring for the older patient, from diagnosis through treatment and beyond. Learn more by visiting saintanneshospital.org/services-directory/cancer-care/senior-adult-oncology. Saint Anne’s Hospital is a community hospital with comprehensive inpatient, outpatient, and emergency care services, serving adults and children from southeastern Massachusetts and nearby Rhode Island at its main campus in Fall River and its community satellites. Founded in 1906 by the Dominican Sisters of the Presentation, Saint Anne's Hospital is a member of Steward Health Care System LLC, the largest community-based accountable care organization in New England. Saint Anne’s has been recognized time and again for quality, safety and service by such organizations as The Joint Commission, The Leapfrog Group, and Blue Cross Blue Shield.